I found some beautiful springtime peas in the pod at the farmer’s market this weekend. Here’s an easy recipe to make them shine on a rainy April day. 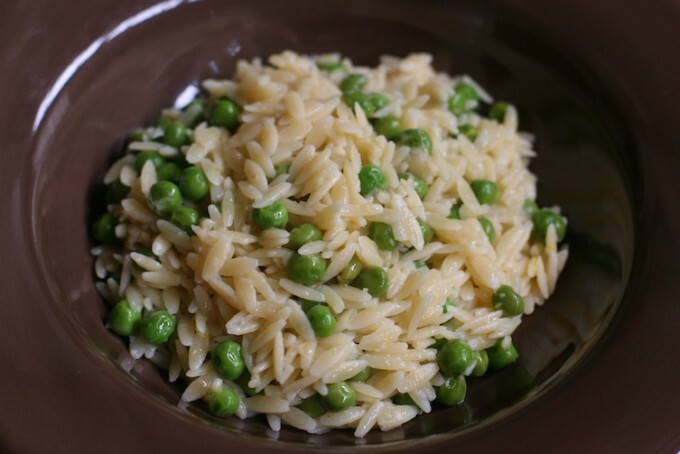 In a large 2-quart saucepan fill three-quarters full with water and bring to a boil, add a teaspoon of salt and then add your orzo pasta and set a timer for 6 minutes. When the timer is done add the peas and continue cooking for another 3 minutes, bringing the total cooking time to 9 minutes. Drain into a colander and then back into the saucepan. Now add the butter and enough olive oil to keep the mixture from sticking and stir to coat all of the pasta and peas. Next grate the lemon zest into the pasta and then squeeze the juice, removing the pits and stir into the pasta. Finish the dish with the Parmesan cheese and salt to taste. This dish is a great lunch on it’s own or as a side dish.